RUSH: Matt Drudge may have a point. Matt Drudge is not happy with the manufacturers of Ambien. Roseanne tweeted that she was using Ambien or on Ambien when she sent the Valerie Jarrett-Muslim Brotherhood tweet. And the manufacturers of Ambien tweeted something to the effect that the side effects of Ambien do not cause racism. So it could be said that the manufacturer of Ambien was mocking Roseanne, which did not sit well with Drudge. 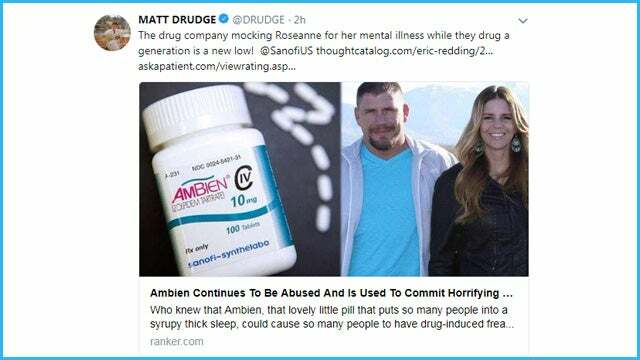 His tweet says, “The drug company mocking Roseanne for her mental illness while they drug a generation is a new low!” The drugmaker’s Twitter handle is @SanofiUS, and Drudge then tweets Ambien side effects and lists them. They are: “Rapid heartbeat. Vomiting. Diarrhea.” Verbal diarrhea. “Impaired vision. Slow breathing. Memory loss. Disorientation. Depression. Suicidal thoughts. Anxiety. Insomnia”? It’s a sleeping pill! You’re telling me a sleeping pill has a side effect of insomnia? Have you ever taken this stuff, Snerdley? (interruption) You have horror stories with it. Kerry Kennedy? She was on the way to the Capitol and wrecked her car? (interruption) Oh. She wrecked her car, but she was not going to Capitol. She was taking Ambien? Anyway… (interruption) Well, but Patrick said it wasn’t booze. Everybody thought the guy got too drunk and he’s out there driving around, and he said, “No, no, no. I was taking Ambien.” I remember that episode. The news covered it extensively, blaming Ambien. Not, of course, the Kennedys. This is… (sigh) I’m trying to think. I think I’ve taken it once, and it was weird. I don’t remember specifically. I guess I would be maybe in the nightmare category, but I’m fortunate. I’ve never had trouble falling asleep. But I’ve had people that… You know, it’s not just this. Lunesta. There’s all kinds of these things, and you hear stories from people that take this stuff that are weird. But the addiction part of it and withdrawing from these things? That’s something a lot of people do not think is gonna happen. I know a guy who was on Ambien for 10 years! It turned out all he had was sleep apnea. He’d sleep until 11 o’clock in the morning in order to get a decent night’s sleep off and on. He finally got into a sleep study program and found out that he was stopping breathing — for 30 seconds — many times an hour. So now he got that CPAP program, that mask and stuff. Now he gets up 8 o’clock every day. He gets a solid night’s sleep and is off of the sleeping medication.